Gilding is an age-old process of covering solid surfaces like stone, wood and metal with a thin layer of fine gold leaf or powder. Historically, this decorative technique has been used to coat intricate artifacts and sculptures with precious metals. For instance, Herodotus talks about the ancient Egyptian practice of gilding wood and metals. Similarly, Pliny the Elder writes that the earliest gilding in Rome was seen after the destruction of Carthage when Romans started gilding ceilings of palaces and temples. The oldest evidence of fire-gilding goes back to circa 4th century BC. China, on the other hand, has a long history of gilt bronze. Over the years, archaeologists have uncovered several ancient Egyptian and Chinese gilded sculptures that have miraculously withstood thousands of years of environmental degradation, while also resisting corrosion. In fact, the outer and middle coffins of Tutankhamun – crafted in wood and gilded in gold leaves – were what protected the innermost coffin as well as King Tut’s mummy. Inspired by this ancient process, Sameh Tawfick, a scientist from the University of Illinois at Urbana-Champaign’s Department of Mechanical Science & Engineering (MechSE) and the Beckman Institute, has pioneered a new preservation technique, involving the bonding of graphene to metal leaves. Graphene, for the uninitiated, is an allotrope of carbon that is made up of a single layer of carbon atoms, arranged in a hexagonal lattice. In this case, graphene – a semi-metal – helps enhance the protective properties of gilding, Tawfick stated. According to him, metal foils or leaves are a scalable coating material with several advantages, including commercial availability and relatively low price. As part of the project, Tawfick and his colleagues covered 150-nanometer-thin palladium leaves with a single layer of graphene. A rare and shiny silvery-white metal discovered in 1803, palladium is part of the platinum group metals (PGMs). Through their research, the team found that attaching a graphene layer to the metal leaves resulted in increased mechanical resistance. Adding one more layer of graphene atoms onto the palladium made it twice as resistant to indents than the bare leaves alone. It’s also very attractive from a cost perspective. 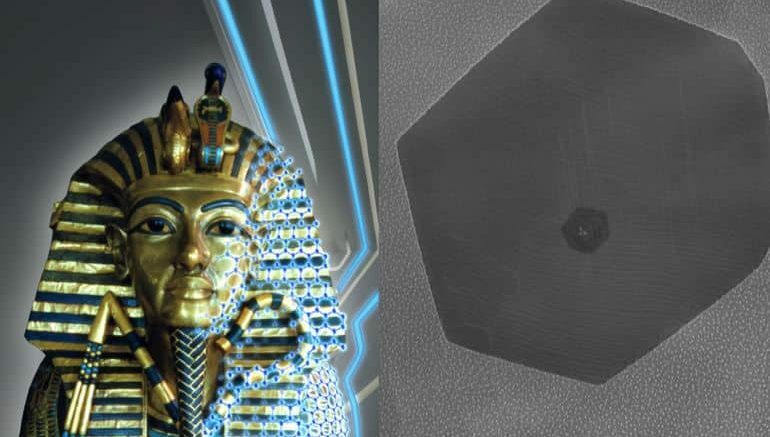 The amount of graphene needed to cover the gilded structures of the Carbide & Carbon Building in Chicago, for example, would be the size of the head of a pin. Furthermore, the researchers have also devised a new technology for growing good quality graphene directly on the palladium leaves. Taking less than 30 seconds, the technology is based on a process called chemical vapor deposition, which entails processing the metal leaves inside a 1,100℃ furnace. Chemical vapor deposition of graphene requires a very high temperature, which could melt the leaves or cause them to bead up by a process called solid state dewetting. The process we developed deposits the graphene quickly enough to avoid high-temperature degradation, it’s scalable, and it produces graphene of very high quality. Taking from an ancient process that has been around for thousands of years, the newly-developed technique of graphene gilding could make it significantly easier to preserve valuable artifacts, the scientists concluded.